There are a number of competitive fellowships available at Rare Book School with various requirements for eligibility. Please refer to the fellowship descriptions below for details. In September 2012, Rare Book School was awarded a grant from The Andrew W. Mellon Foundation to fund The Andrew W. Mellon Fellowship of Scholars in Critical Bibliography. The aim of this new program is to reinvigorate bibliographical studies by providing focused training and mentorship for doctoral candidates, postdoctoral fellows, and junior faculty in the humanities. Mellon Fellowships include three years of support for RBS course attendance and research-related travel. The deadline for application to the program is December 1, 2012. Interested scholars are encouraged to apply as soon as possible; see the RBS-Mellon Fellowship page for more details. graduate students at the University of Virginia. RBS accepts applications annually for the fellowship program, offering full scholarships to attend RBS with the intention of advancing UVA student scholarship. complete a standard application to RBS, and submit it along with the proposal and letter of recommendation, plus a c.v.
A list of 2011 RBS-UVA Fellowship awardees is available here. Students admitted to the program in 2012 will submit their projects in April 2013. 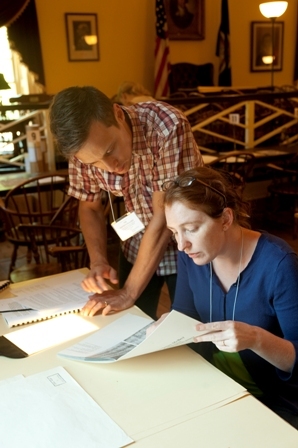 Rare Book School’s fellowship program began with the E. Ph. Goldschmidt Fellowship in 1995, followed in 1999 by the Reese Company and San Garde Fellowships, and in 2001 by the Ian Willison Fellowship. Applications for these four fellowships are by invitation only, but RBS has a generous general scholarship program; see the RBS Scholarship page for details.